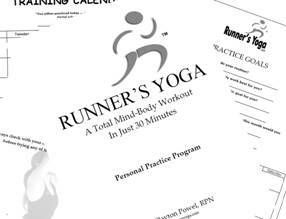 This is the proprietary Runner’s Yoga audio recording that is coordinated with all the instructional material. In the short sample below you’ll hear the beat, breathing cues, and verbal directions that talk you though every movement of the 30-minute Runner’s Yoga yoga routine. The Illustrated Manuals show you every second of every move with clear explanations of every element. They coordinate perfectly with the audio recording and movie files and also provide a fascinating look at the research and science behind what you’re doing. Six separate poses (4 are repeated twice for a total of 10 movements) are linked together in this series of moves that start to warm up and gently stretch the whole body. Known as sun salutes in yoga jargon, each Mountain Series A is shown with all of the Runner’s Yoga options and variations for different levels of fitness and flexibility. Used on their own they are a great total-body warmup. With the audio recording they flow with the beat and Core Breathing and prepare your body for everything that follows. Three more poses are added to the six you’ve been moving through, building considerable more strength, intensity, and internal heat. There are easier versions for each pose, of course, but also some very advanced options for those who are ready for a challenge. Each Mountain Series B is repeated 3 times. From Mountain Series B you move right into the 7 poses of the Standing Sequence. Most of them are done on both the right and left side, each pose flowing into the next. This sequence is particular good for balance (proprioceptor work), core strength, the hamstrings, hips (including hip flexors), and shoulders. Onto the floor we go for the next 7 poses. Stretching and strengthening the back, abdominals, ankles, knees, hips, groin, and deeper work for the shoulders. Deep stretching of the back of the body from head to toe, with balanced opening of the chest, shoulders and hips. We finish with some dynamic core work, then a short rest period. The flowing series of movements is divided into five short sections that allow you to move at your own pace. And to review whenever you wish! They coordinate perfectly with Illustrated Manuals #2 – #7 and focus on showing you how to put yourself into proper alignment using creative self-adjustment cues like “Frog Hands” and “Tight Jeans”. The complete Runner’s Yoga routine, pose-by-pose, in 8X11 format. Great visual aids to help you learn and practice the routine. Print them up back-to-back and you have the whole routine on one sheet of paper you can take anywhere. Fold them in four, they fit in your pocket. Laminate them, they’ll last forever and you can even use them to practice outdoors. Sometimes the simplest tips can be the most valuable … and illusive! My eclectic backgorund has taken me around the world and everywhere I’ve gone I’ve found teachers who have helped me fine-tune my own practices in yoga, martial arts, fitness training, and mental focus. I offer you here some of the most practical tips I’ve collected. Tips that can help you take your Runner’s Yoga practice to the next level – a safe, regular routine that you’ll do year after year after year. Are you the kind of person (like me!) who is intrigued by what is actually happening when we do certain poses or movements? And not just from the perspective of the ‘Yoga World’, but the view of western science as well? Then you’ll enjoy this concise look at the basic biomechanics, physiology, and benefits of each individual pose. When and where will be the best time and place for you to do your Runners Yoga. Specific, realistic goals for how often you want to practice. Exciting rewards that will help you meet those goals. *Image is a visual depiction of mp3 file.